This game ball was presented to First Lady Betty Ford by the Chaplain of the National Football League after a Monday night Football game in September of 1975. The inscription is in white print and reads, "Game Ball / Awarded to / Mrs. Betty Ford / From coach George Allen / and Washington Redskins / Washington 30 - Denver 3 / September 30th., 1974 / Monday Night Football". 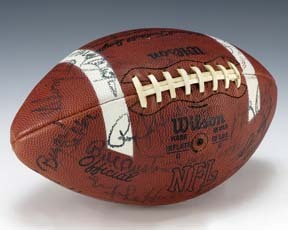 Signatures in black marker cover the ball. Notable signatures include Hall of Famers Deacon Jones, Ken Houston and Charley Taylor.